Terra Nova Laser: Has anyone shortened the end poles? I have one of these tents. I'm about to give it some intensive bike-ported use, and I'd like to shorten the end poles. Has anyone done this? 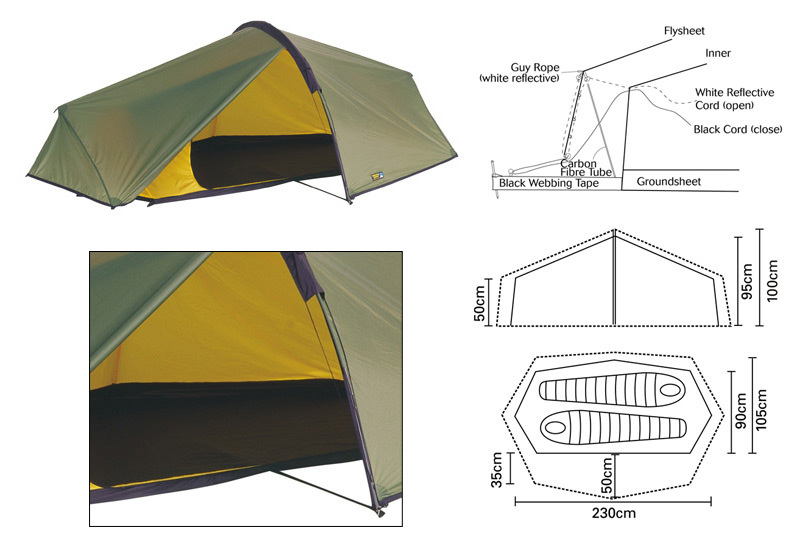 The rigid parts of the tent consist of one main central pole, which folds, and two carbon rods, one at either end, which don't. This is a problem, as they're a bit too long. 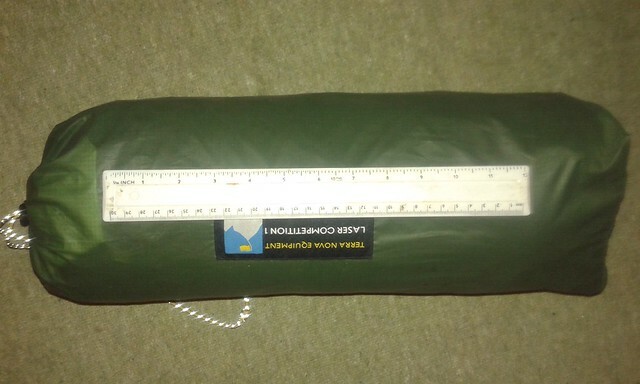 I'd like to carry the tent in a frame bag (this sort of thing) but the rods are 56cm and I've got about 52cm to play with inside the frame. In the past I've carried the tent lashed to the top of the rack, like in the picture below. I'd prefer to carry it under the top tube though, for several reasons. Removing the end rods in transit isn't really an option: I've tried that before and it makes the tent a complete pain to pitch; I'd leave it strapped to the rack rather than remove them again. 1) Shorten the poles. Has anyone tried this? I'm inclined to think it would spoil the cut of the tent, and am loath to try. 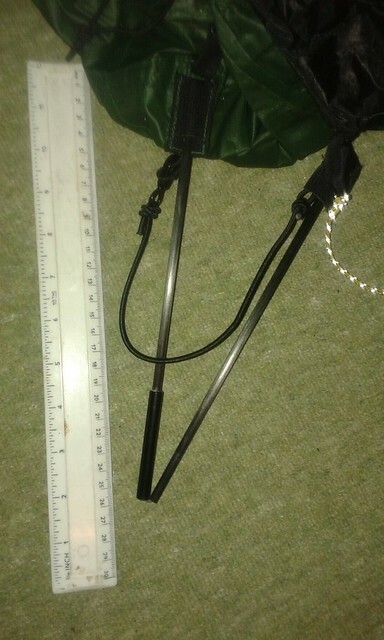 3) Similar to (2), buy some normal telescoping tent poles and cut them to size. I'd only need a single join in each pole, so I could manufacture two end poles that had an elastic join in them, and halve them for transit. 4) Get some shorter dummy poles so I can remove the long ones but use the dummies to keep the tent in order during transit. I doubt this will work tbh. Does anyone have any experience of doing any of these things? I'm tending towards (3) but would like to hear from anyone who's done it before. Re: Terra Nova Laser: Has anyone shortened the end poles? Obvious suggestion: Remove your original poles and put them in a Safe Place. Whatever strategy you end up using, do it with alternative poles, so you haven't compromised the originals. If they're anything like the corner poles on an Akto, I expect you could obtain materials to molish a splittable replacement (as per option #2) from a seller of kite stuff. Shortening the poles will ruin the shape of the pitched tent. I used to put up fabric structures when I was at uni., any variation in the setting out affected the way these things pitched, dramatically. They use the same design programmes for fabric structures as they do for tents. Yes, hence why I'm thinking more along the lines of a foldable/splittable pole. That's a good suggestion on the kite front, I know a shop I can go to for that. 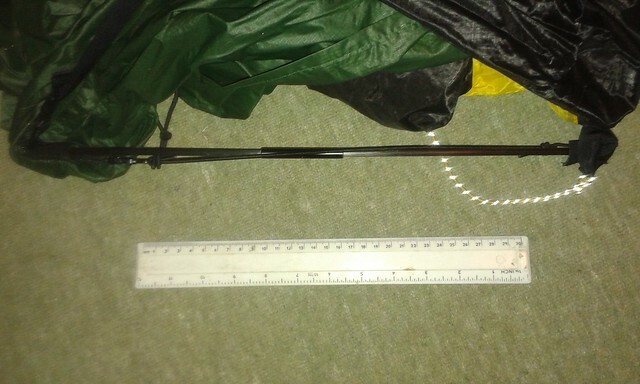 I'd been thinking of cannibalising an alu tent pole but that would probably involve some modification of the sockets the poles fit into, as the current ones are quite narrow and the fit is quite tight. I've got a Laser of some sort and I think my end poles fold - worth checking with Terra Nova if they could sell you a spare set, assuming they meet requirements. Why not measure the length and see if you can get some alu replacements that split. Anything too long can be cut down with a pipe cutter. I have a Laser Competition 1. The end poles split and are shock-corded. The pack size is about 42 cm. I can do a photo if that helps. There you go. Note that the pole has the usual internal shock cord like a 'normal' pole but also has an external (and somewhat beefier) one also. The previous owner of my Zephyros cut the poles in half as per option 2 just for this purpose. They stuck a wider tube over to allow re-connection. It works fine with no issues.